This year’s 24 Hours of Le Mans wasn’t just incredible for being unusually carnage-heavy on its flagship prototype class. The LM GTE Pro class full of production-based race cars was anybody’s game until the very end, with the most insane final laps I’ve seen all year. This year, Jordan Taylor was in for the final stint in the No. 63 Corvette C7.R. Back in 2015, he infamously hid in the bathroom because he was too nervous to watch his teammate drive the car through to the checkered flag for a win. This year, it was Taylor’s chance to seal the deal himself on sports car racing’s biggest stage. Taylor’s final laps felt like the world’s most high-stakes game of keep-away from the No. 97 Aston Martin Vantage of Jonny Adam. Adam was practically tailgating the Corvette in spots, forcing Taylor to answer back with clever defensive moves. Adam tried to pass for the lead at Arnage, but he locked up his tires and went wide, leaving the door open for Taylor to bump on through and retake the lead. Shockingly, with just over two and a half minutes left in the race, Adam’s pressure on Taylor’s rear bumper paid off. 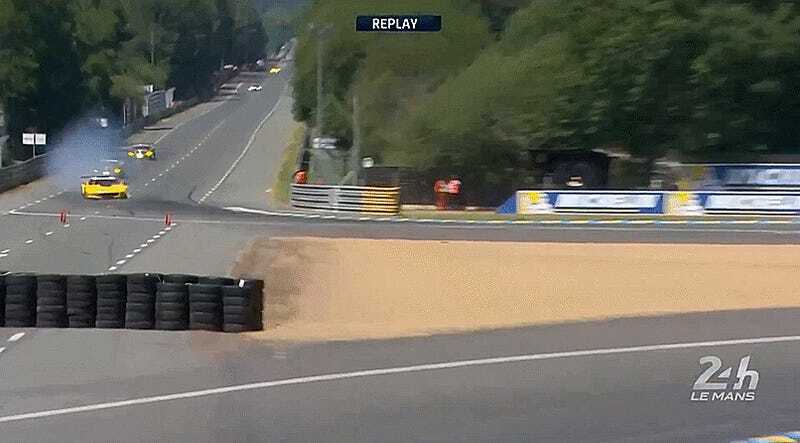 Taylor locked up his brakes and took a shortcut across a gravel trap in a chicane, damaging the front of the Corvette. Initially, everyone was wondering if the Corvette would be punished for using a shortcut to retain the lead—however inadvertent it may have been—but soon, the damage started to show. Loose bits started coming apart in the front of the car, leading to a tire puncture that cost him the lead. The shortcut had cost the No. 63 Corvette a win, slowing it so much that the No. 97 Aston Martin and the No. 67 Ford GT were able to pass it and bump the No. 63 team down to the bottom step of the podium. Ouch! 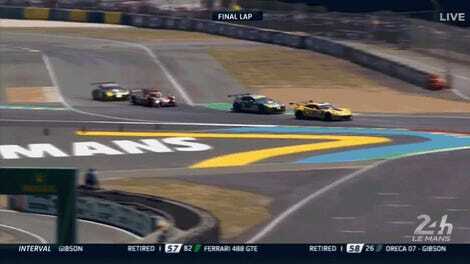 It was a fitting end to a race that saw numerous lead swaps and insane battles in the LM GTE Pro class. Unlike last year where the Fords and Ferraris were noticeably faster than the other cars, everyone in the class was pretty evenly matched and more importantly, thirsty for that coveted Le Mans trophy.